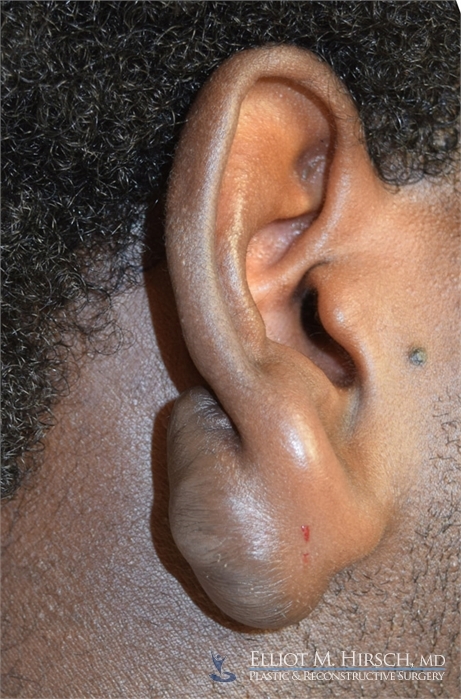 Keloid scars are a common problem in African-american, Hispanic and Asian patients in Los Angeles, as well as in other patients. They can be very disfiguring and are frequently itchy and painful. Keloids are very difficult to treat as well, and have a high rate of recurrence. A keloid scar is a scar that has increased in size since the initial injury or surgery, and has grown beyond the original boundaries of the scar. Keloids are commonly confused with hypertrophic scars, which have increased in size but are still within their original boundaries. Keloid scars are actually composed of bundles of collagen, which is present in normal skin but is present in far greater amounts in keloid scars and is highly disorganized. Nobody really knows what causes keloid scars. They are more common in Asian, African-American, and Hispanic patients and tend to have a genetic component. 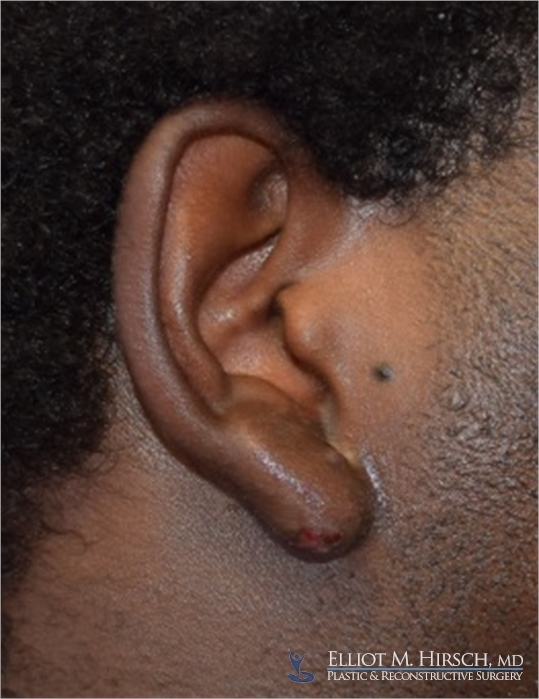 For a keloid to form, there is almost always some type of skin injury which could be a cut, earlobe piercing, or even an insect bite or a pimple. How do I get rid of keloids? Once keloid scars occur, they are extremely difficult to completely treat and have a very high recurrence rate. To treat itching and some of the irritation that can occur with keloid scars, steroid injections may be helpful. However, this will not remove the scar or significantly change the appearance of the keloids. In order to remove keloids once they have grown, surgery is often used. Unfortunately, when surgery alone is used, it can lead to very high recurrence rates, up to 90% in some cases. 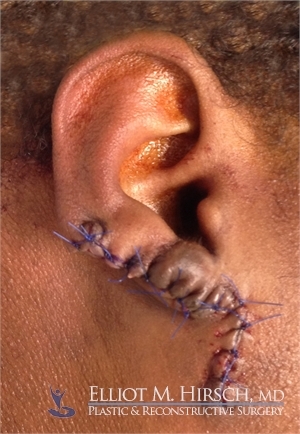 However, when combined with post-operative radiation therapy, surgical treatment of keloid scars can be very effective. Los Angeles plastic surgeon Dr. Elliot Hirsch believes in an individualized approach to treating keloid scars and will work with you to develop a treatment plan that meets your individual needs. In general, Dr. Hirsch uses a combination of steroid injections, surgery, and post-operative radiation therapy, which results in a highly effective treatment regimen with a low recurrence rate! When considering keloid surgery, it is important to remember that any additional incisions in your skin could potentially cause new keloid scars! Therefore, it is important to minimize the size and extent of incisions. Depending on the size and location of your keloid scars, Dr. Hirsch will use a different type of surgical treatment. Most keloid treatments can be performed under local anesthesia, and Dr. Hirsch frequently performs keloid surgery in his Los Angeles area offices in Burbank and Encino. Small keloid surgery - For keloids that are small and have a narrow base, Dr. Hirsch will often completely excise the keloid scar and use steroid injection and post-operative radiation to minimize the chances of recurrence. 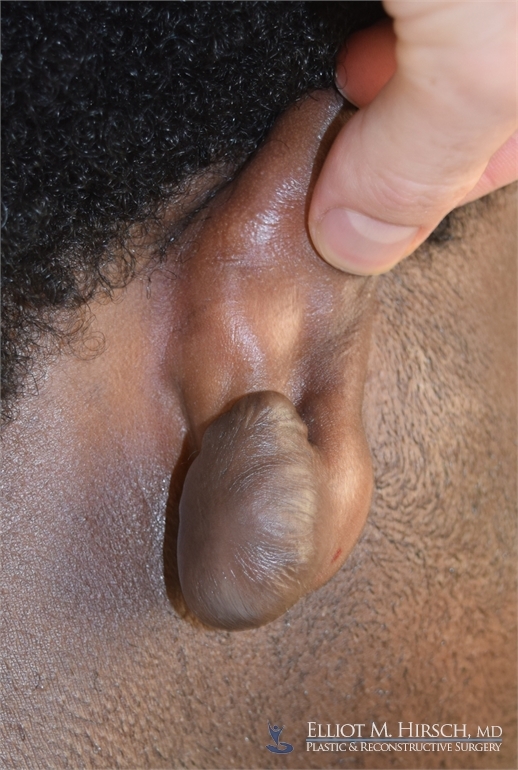 Large keloid surgery - For keloids that are large or have a wide base, Dr. Hirsch will often shell out the keloid and use the residual keloid skin and scar to recreate the shape of your ear.